Oh my goodness, the moment I saw this fragrance in Madison Valley’s scent list, I knew I wanted to review it. 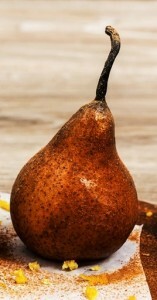 I love pear fragrances… add some warm spice and I’m in heaven and this version sounded mouthwatering. Close your eyes as you inhale this scent and you’ll imagine a fresh, juicy pear. Our Spicy Pear candles’ fragrances include a hint of leafy greens dusted with sugared cinnamon spices, too. Sweet pears dusted with cinnamon sugar spices? Sign me up!! Smelling the wax for the first time… I smelled sweet pear all the way with subtle spice notes which to me was perfect. Sometimes the spice element can dominate a fragrance too much which can drown out all the other components…. with this fragrance, the cinnamon was just a subtle background and to my nose, it was perfect!! Time to light my candle. Since this candle was pretty large and had 3 wicks, I decided to light it up in my master bedroom which is a pretty large room. Once lit, it didn’t take long for the candle to reach a full melt pool and the aroma…. mouthwatering just as I hoped it would be!! It smelled like the sweetest pear and I’m not talking a tart and candy like pear I’m used to burning. Oh no! This fragrance smelled like the real deal. A sweet and juicy pear with the spice notes extremely subtle. To me, this fragrance was all pear. I was mesmerized. Strength – on a scale of 1 to 10, I would rate this candle an 8. Not super strong but gave a nice and steady medium scent throw. It was decent. My candle burned perfect. Zero issues. Clean and even burn from start to finish. I did have to vigilant with keeping all three wicks trimmed before each lighting but that’s pretty normal. I can’t stress enough how important wick trimming is or the flames came become out of control. So far, this is my favorite fragrance from Madison Valley and I have one to to go. Spicy Pears was AMAZING!! And honestly, it was the most authentic pear fragrance I’ve tried to date and I didn’t know it till I tried this candle. So I think it’s safe to say, any future pear fragrances I try from this point on will be compared to this one. I’m enjoying this brand and definitely have them on my radar to try and review more fragrances down the road. FUN!! Oh and lastly…. want a chance to win a gift basket filled with scented goodies from Madison Valley valued at almost $100.00? HUGE prize up for grabs Candlefinders and a great way to sample some scents from this company. Details posting soon on our Candle Chat page so stay tuned! This candle pretty much gets 5 stars across the board. Presentation was great, it was beyond authentic, it performed perfectly and the strength was awesome! 5 stars! Have you tried Spicy Pears from Madison Valley Candles? Review it with us. In the comment section below, review and star rate your experience… it’s easy! Spicy Pears scent description: Close your eyes as you inhale this scent and you’ll imagine a fresh, juicy pear. Our Spicy Pear candles’ fragrances include a hint of leafy greens dusted with sugared cinnamon spices, too.